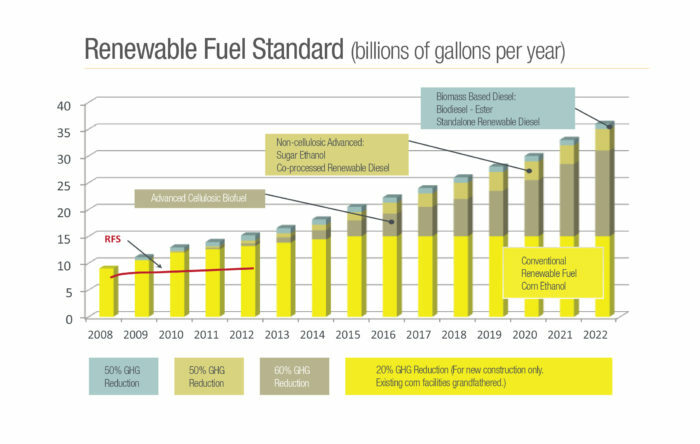 For the past year or more, there has been a lot of discussion in the transportation fuels industry on moving the current Renewable Fuels Standard 2 (RFS2) point of obligation to the point where rack blending occurs. Currently the point of obligation is with refiners and importers, however the RINs for RFS compliance are separated further down the supply chain by companies who blend the renewable fuels. Several obligated parties have petitioned the EPA to change the rules of the standard and move the RFS2 point of obligation. Until recently the EPA has proposed rejecting these petitions. However, with a new EPA administrator the decision to reject the petitions is still up in the air. What does this mean for the various parties involved in the RFS? We will discuss this topic through a series of articles over the next few months. In this first article, we will discuss how the RFS currently works. RFS2 is the nickname given to the EPA regulation issued in compliance with Congress’ Energy Independence and Security Act of 2007 (EISA) legislation. Figure 1 summarizes the initial requirements of RFS2. There are four obligation categories: Advanced Cellulosic Biofuel, Non-Cellulosic Advanced, Biomass Based Diesel, and Conventional Renewable Fuel. As passed by Congress and promulgated by EPA, the rule places the obligation for meeting the RFS annual requirement on refiners and importers, known as obligated parties. Each year EPA is supposed to propose and finalize the volume requirements for each compliance category of fuel as well as the total renewable fuel requirements. EPA then divides each of these requirements by the total gasoline and diesel production expected for the year in question. This results in a percentage obligation for each of the four categories. At the end of each compliance year, the obligated party multiplies their gasoline and diesel production or gasoline and diesel imports by these percentages to determine their Renewable Volume Obligation (RVO). In order for the obligated party to demonstrate annual compliance to EPA, they must obtain and retire the Renewable Identification Numbers (RINs) associated with specific renewable fuels. Table 1 shows the various types of RINs under RFS2. Table 2 shows which types of RINs can be used to meet each of the four obligation categories. When a renewable fuel is produced using an approved pathway, a RIN is attached to each gallon and recorded in EPA’s Moderated Transaction System (EMTS). Each sale of the renewable fuel and RIN is recorded in the EMTS until the RIN is separated from the gallon of renewable fuel. In general, the RIN can be separated when the renewable fuel is blended into gasoline or diesel. Or it can be separated by an obligated party when they acquire the renewable fuel with the attached RIN. This separation of RINs is also recorded in EMTS. Once separated, the RIN can be bought, sold, or retired. In addition to obligated parties, renewable fuel producers, and non-obligated blenders, RIN brokers and traders can also participate in the RIN markets. The above description does not include many of the complex details of the RFS but is sufficient to understand how the obligations are created and met. In the next article in this series, we will discuss some other methods for generating RINs. We will also examine terminal blending in more detail.